Knee pain is extremely common, especially for people who are over the age of 50. 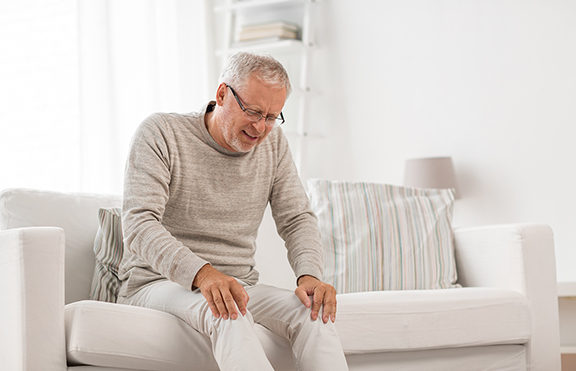 While there are many causes for knee pain, the most common is due to osteoarthritis (OA) — often referred to as degenerative joint disease or simply “wear and tear” arthritis. With OA, the cartilage within a joint begins to break down and the underlying bone begins to change, causing pain, stiffness, and swelling. Cartilage is the slippery tissue that covers the ends of the bones in a joint, which allows the bones to rub together. These changes usually develop slowly and get worse over time. The pain from osteoarthritis can also cause reduced function and disability to the point that some people are no longer able to do daily tasks or work. Osteoarthritis occurs most frequently in the hands, hips, and knees. The knee is particularly susceptible to OA because it is a very complex joint that is under constant pressure every day. The risk for developing osteoarthritis increases with injury or overuse, such as knee bending and repetitive stress on the joint such as running. Women are more likely to develop OA than men, especially after age 50, and genetics can also increase a person’s risk. One major cause of OA is being overweight. Extra weight puts more stress on the weight-bearing joints like the hips and knees. There is no cure for OA, and the thinning of the cartilage is irreversible. Therefore, the only treatment method for osteoarthritis is to keep the remaining cartilage as healthy as possible by increasing physical activity and being at a healthy weight. The pain is usually managed by medications, injections, and joint replacement surgery. However, there is a new treatment option under investigation to treat osteoarthritis of the knee. Millennium Pain Center is participating in the Roccella study that is testing a new drug that may prevent or decrease cartilage destruction to reduce knee pain. The goal of this study is to determine if the drug is safe, well-tolerated, and effective. Before any medication can be approved and made available to the public, it has to go through several phases of clinical research. Each phase has a different purpose and helps researchers answer different questions. Phase IV trials: After a drug is approved by the FDA and made available to the public, researchers track its safety in the general population, seeking more information about a drug or treatment’s benefits and optimal use. The Rocella Study has passed phase I, and researchers are now working on phase II. People choose to take part in a clinical research trial to help advance science, and also to possibly receive the newest treatment and to have added (or extra) care and attention from the clinical trial staff. There is no cost to participate in this clinical trial, although there are certain eligibility requirements. Clinical trials such as this one offer hope for many people and a chance to help researchers find better treatments for others in the future. As leaders in pain control, research, education, and advocacy, the doctors, nurses, and staff at Millennium Pain Center not only understand the pain patients experience, they want everybody to understand they do not need to live with pain. Being leaders in pain control means not only offering the most advanced treatments, but also staying on the leading edge of medical research by offering an opportunity for patients to participate and benefit from the latest research and treatments that are not available yet to the general public. Most people associate clinical research trials with medical centers in much bigger cities, so it is very unique that the same clinical trials that are happening in Chicago, New York, and L.A are also happening right here in Bloomington-Normal. For more information about the clinical trial for knee pain, please contact Katie Mahnke at Millennium Pain Center at 309-220-9852. There is also a trial being conducted for back pain. Millennium Pain Center is located at 2406 E. Empire St. in Bloomington.